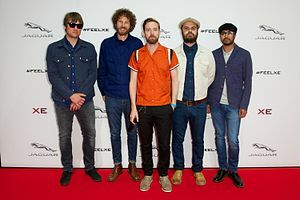 Kaiser Chiefs is an alternative rock band from Leeds, England. They were active as Parva from 2000 to 2003, then changed their name to Kaiser Chiefs in 2003. Their name come from the name of the Kaizer Chiefs association football club in South Africa. Kaiser Chiefs 2016 album stay together was very sucsessfull. ↑ "Kaiser Chiefs interview". BBC Online. Retrieved 24 July 2010. This page was last changed on 16 January 2019, at 19:33.